﻿How Does A Taser Gun Works? EFFECTIVE: A TASER can be conveniently discharged to work anywhere on the body, unlike other conventional weapons with a specified target area. This makes the TASER more effective self defense option by making it easier to stop a threat under an already stressful situation. TASER devices have been used effectively by law enforcement encounters by over 10,000 police agencies in over 4 countries, boasting a 95% effective rating. TASER technology provides one of the only non-lethal means of stopping an attacker dead in his tracks, even if under the influence of drugs or alcohol. RESPONSIBILITY: Normal law-abiding citizens carrying a TASER for self defense purposes should have no problem acquiring this highly effective tool. However, to further promote responsible ownership, the TASER will only function after the owner completes a background check through TASER International to prevent misuse. No activation fee. You will be provided a phone number or web address for this purpose. As always, purchasers MUST be 18 years old or older. 1. Are TASER electronic control devices considered firearms? No. The Bureau of Alcohol, Tobacco and Firearms have stated that TASER ECDs are non-firearms in 1998 and in 1994. 2. What is a TASER? 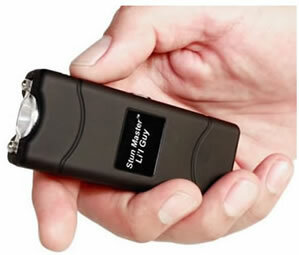 A TASER is a personal safety electronic control device that can stop threats up to 15 feet away. It works by launching out two probes up to 15 feet from a disposable TASER cartridge. The probes deliver a scientifically designed electric signal that makes muscles lock up, therefore temporarily incapacitating an attacker for 30 seconds so that you can get to safety and call 911. 3. Is the TASER a lethal weapon? No. In fact, TASER devices have been proven statistically to dramatically reduce injury rates to suspects and police officers as well as to increase personal safety and community security compared to any other use of force option. However, TASER devices are not risk free and may cause injuries, primarily from falls or physical exertions, so their use should be taken seriously. 4. Are TASER devices more dangerous to people with pacemakers? Both the human heart and pacemakers are able to withstand the power of a defibrillator that emits around 300 joules ("joolz") of energy. A TASER device emits less than one joule of energy. TASER devices have been used over one million times by either TASER International or law enforcement without causing a single death. 5. Is the TASER the same model that law enforcement officers use? No, law enforcement agencies use the TASER X26 and the ADVANCED TASER M26 that are only available to law enforcement. Those units are capable of recording data useful to officers in court. The TASER is a consumer model that utilizes the same technology and stopping power in a smaller size. 6. Is it legal to carry a TASER device? Yes, but there are some limitations. You cannot carry any TASER device on an airplane (it must be in your checked in luggage) or take them into public buildings like courtrooms or in some schools. If you are over the age of 18, they can be legally possessed in 43 states. Please check your local laws before purchasing or carrying any type of electronic control device. 7. Are there any restrictions to fly or travel internationally with a TASER device? When traveling by air, TASER devices need to be placed in your checked bags and not carried on the plane. Also, do not try to take it out of the country - please leave it at home if you are traveling abroad. Please check with your airline or other carrier for any new guidelines in advance of traveling. 8. Is using a TASER device similar to shooting a gun? Not exactly. There isn't a kick or recoil with a TASER device but you will hear a loud pop like a balloon popping. 9. How many times can I use a cartridge?TASER's are packaged with one TASER cartridge. As each TASER cartridge can only be used once, you may want to consider purchasing additional cartridges. 10. How does the TASER device shoot out the probes? TASER cartridges use compressed and inert nitrogen to launch out the probes. TASER cartridges are a one-time use system and delivers the probes at approximately 100 MPH. 11. What if I miss my target?The end of the TASER can also act as a powerful contact stun gun, which is a powerful backup capability. 12. Does the TASER work on animals? Law enforcement officers have successfully incapacitated vicious animals with various TASER systems. TASER units were designed for human use, which is why the probes are deployed vertically. Most animals bodies are horizontal to the ground meaning you will have to adjust the way you hold the device in order to get both probes to hit your target. Stun Guns and Taser™ devices are reported about all the time. So much so that the average Joe uses those words interchangeably. However, they are not the same thing. Stun guns and tasers have a very important tactical difference: Effective Range. A Taser device such as the new Taser C2, allows you to repel the attacker from up to 15 feet away (7-10 feet being optimum target spread). That is a BIG difference from a stun gun, which requires direct contact. Police carry their own version of a Taser device which you hear about if watch the news. The police version is similar to the C2's predecessor, Advanced Taser. However, the law enforcement version does have a longer range (21 feet compared to the civilian 15 feet). ﻿The active ingredient in pepper spray is OC or oleoresin capsicum. The OC is derived from Cayenne peppers – some of the hottest peppers in the world. OC is a reddish-orange, oily liquid, insoluble in water. Broken Stream/Heavy Stream – very effective for hitting multiple targets (or in the dark), can be fanned for covering wider area. Provides heaviest blast of pepper, but cans will empty quicker. Range normally 15-20 feet, not affected by breezes and winds as much as fog and cone sprays. Foam – very good blow-back protection and immediate saturation, even in windy conditions. This thick, sticky foam works instantly on the attacker. Pepper spray normally comes in aerosol type containers, some no larger than a lipstick. Some are small enough to attach to a key chain. Most of these non-lethal sprays can be fired several times and have a range between 8 and 20 feet, depending on model and size. The size of the pepper spray unit generally determines its capacity. Pepper spray is not the same as mace or tear gas sprays. The popularity of these defense sprays has grown tremendously over the last few years due to the increase in violent crimes. Law abiding citizens are realizing that they have to depend on devices like this to protect themselves and their families. There are around 40 manufacturers of this type of spray, who offer various sizes, formulations and spray types. However there is only one chemical composition, which should be considered for use by the general public in a self defense situation. It is estimated that at least 15,000,000 Americans now carry a personal defense spray, the majority of which are OC pepper. Tell me more about State Restrictions. Always carry self defense products such as Mace spray, pepper spray, a stun gun, personal alarm or TASER.